Who is the best receiver in the NFL? Statistically speaking, it's Antonio Brown, but stats tell only part of the story. DeAndre Hopkins hasn't played a full season with anyone close to Ben Roethlisberger's talent throwing him the ball. Yet Hopkins is fifth in receptions, third in receiving yards and third in receiving touchdowns since the start of 2015. Hopefully Deshaun Watson will show what Hopkins can do with a full season of catching passes from a dynamic QB. In just seven games before Watson tore his ACL last November, Hopkins caught seven touchdown passes, the most he has from any quarterback. Odell Beckham Jr. and Julio Jones also can make a case for being considered the best of the best, so we asked a panel of ESPN NFL Insiders to settle the debate and make their picks for the best receiver in the NFL. Not surprisingly, No. 84 in black and gold garnered the most support, but it wasn't unanimous. Who is the best receiver in the NFL? 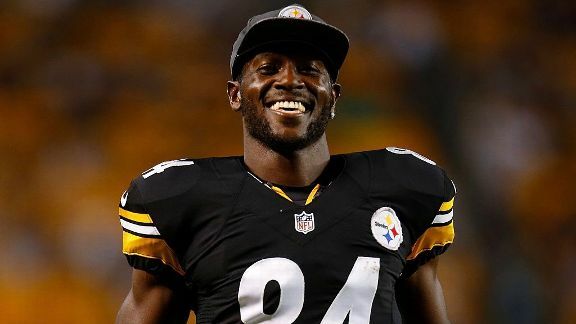 Mina Kimes, senior writer -- Antonio Brown: Before going down with an injury near the end of the season, the Pittsburgh Steelers WR was a worthy MVP candidate; he ended up averaging 109.5 receiving yards per game, nearly 18 yards more than anyone else. Julio Jones is more physically imposing and Odell Beckham Jr. can deliver more circus catches, but Brown is the most versatile weapon of the three, which makes him the most dangerous receiver in the NFL right now. Because of his rare combination of straight-line speed and fluidity -- Brown changes direction on a dime like Pac-Man evading ghosts -- he can run every route at an elite level. He also racks up prolific yards after the catch, finishing third among all receivers last season, despite his injury. With Brown, you get both reliability (he finished the season with a drop rate of 1.9 percent, 10th best in the NFL), and big-play potential (he caught 27 balls on passes thrown over 20 yards, leading all receivers). While he surely benefits from playing with Ben Roethlisberger and Le'Veon Bell, his Hall of Fame-caliber playmaking ability is undeniable. If I were building a team to compete this season, he'd be my top pick at the position. Field Yates, NFL Insider -- Antonio Brown: While this will sound like simplifying matters, if you ask a general manager where the scouting process for wide receiver begins, there are two key traits: getting open and catching the football. Receivers get open in myriad ways: some win with speed, some with size, others with agility. Antonio Brown wins in many ways, and he just keeps winning. He's the league's most precise route runner, combining footwork with field vision, instincts, consistency and understanding of leverage by defenders. It's not just how Brown gets open, it's that when the ball is thrown his way, he makes good on it. Brown has a total of eight drops over the past three seasons, a minuscule total when considering he has seen 412 targets during that stretch. He has a unique catch radius for a player of his size (5-foot-10) and the toughness to leap into traffic for contested catches. After the catch, Brown is a wizard: fast and quick, strong and slippery, determined and committed. Bringing him down is no easy chore, as he finds ways to prolong plays to take them from routine to explosive. Without a hole in his game, Brown paces the league at wide receiver. The Cowboys are favored to win three of their final four games, according to ESPN's Football Power Index. Matt Bowen, NFL writer -- Antonio Brown: Julio Jones could join this discussion. DeAndre Hopkins, too. And Odell Beckham Jr.'s explosive-play ability puts him in the mix. However, it's pretty clear that Antonio Brown is the top wide receiver in the NFL when looking at his upper-tier numbers, along with the silky-smooth game film that rivals a coaching clinic on the position. With five straight seasons of 100-plus receptions and 1,000-plus yards, plus 52 touchdown grabs over that stretch, Brown is the model of consistency. And, we have to remember, Brown continues to fill up the box score despite lining up against defensive coverage schemes that are scripted to limit his total production. Whether opponents are rolling a safety over the top or essentially "doubling" Brown in critical game situations, the Steelers' wide receiver still manages to beat secondaries at all three levels of the field. How? Just watch Brown's professional approach on the film. We are talking about a fundamentals-based wide receiver here, a master of technique. The footwork, the fluid hips, the refined route-running skills. That's why Brown can shake even the best coverage guys in the league. He can win underneath, create separation on intermediate routes or blow the top off the secondary. For young players at the position who want to study greatness, it starts with Brown. He's the most complete wide receiver in the game today. Antonio Brown is considered the best receiver in the NFL, and for good reason, but these three also can make a case for at least being in the conversation. Julio Jones: Since the start of 2014, Jones has played the same number of games as Brown (61) and has almost the exact same number of yards (32 fewer) but has done it on 61 fewer receptions, averaging 15.4 yards per reception vs. 13.5 for Brown. Jones also has 106 20-yard receptions during that span (most in the league), compared to 93 for Brown. DeAndre Hopkins: Since the start of 2015, he's fifth in receptions, third in receiving yards and third in receiving touchdowns despite having the most unstable quarterback situation among the players on this list. Since 2014, he has accounted for the highest percentage of his team's receiving yards in the league (34.7 percent). Brown is third on that list, behind Hopkins and Jones. Hopkins also has the highest share of his team's targets in that span. Odell Beckham Jr.: Since the start of his career (2014), Beckham has caught a TD pass every 8.2 receptions; Brown has caught one every 10.7. Beckham's TD rate is the best of any player with at least 250 catches over that span. On a per-game basis, if you gave Beckham the same number of games as Brown over this span, he'd have 49 touchdowns since entering the league, the most in the NFL. Aaron Schatz, editor-in-chief of Football Outsiders -- Antonio Brown: Based on production, there's no question that Antonio Brown is the best wide receiver in the game right now. He was No. 1 last year in Football Outsiders' total value metric DYAR (defense-adjusted yards above replacement) despite playing only 14 of 16 games. He's been No. 1 in DYAR in three of the past four seasons, and was seventh in the other (2016). Only Brown and Julio Jones have ranked in the top 10 in at least three of the past four years. Part of what makes Brown so dangerous is his abilities all over the field, both as a deep threat and as a short possession receiver. If we split passes into short (up to 15 yards through the air) and deep (16-plus yards through the air), Brown ranks in the DYAR top five for both types of passes. Keenan Allen is the only other receiver who was in the top 10 for both short and deep passes in 2017. Dan Graziano, national NFL writer -- Antonio Brown: For me, it's Antonio Brown, because you just can't argue with the consistency of production. Odell Beckham Jr. has the skills to be the best, but he just missed basically a whole year due to injury and hasn't put together as many monster years as Brown has. Brown has at least 1,284 yards and at least 101 catches in each of the past five years. He's led the league in catches twice and in yards twice over that time, while missing a total of three regular-season games. He functions as a reliable possession receiver when that's what Ben Roethlisberger needs him to be, but he also has the ability to make the game-breaking long catch. Teammates marvel at his work ethic, describing him as a "technician" who's determined to hone every aspect of his craft until it's as good as it can possibly be, and it shows on the field. No receiver in the league has produced as brilliantly and consistently as has Brown for a half-decade now. He turns 30 next month but shows no signs of slowing down. Domonique Foxworth, The Undefeated senior writer -- Odell Beckham Jr.: Using a raw statistical comparison, it is tough to argue against Antonio Brown or Julio Jones. They are essential parts to two of the most outstanding offenses in recent NFL history. But it would appear that Odell Beckham Jr. is more than just a part of the Giants' offense. He is the offense. Or at least he was the offense in 2016, when the Giants went 11-5. The Giants lost Beckham to injury early last season, and it was evident in their offensive production. Without Beckham the Giants finished 3-13 and went from 19 points to 15 points per game. Beckham doesn't benefit from creative offensive schemes or an imposing rushing attack, which means he rarely, if ever, gets an easy catch or man coverage. But that hasn't hurt his production. According to ESPN Stats & Information, since the start of his career, Beckham has scored a TD on one of every 8.2 receptions. Brown has caught one per 10.7. Beckham's TD rate is the best of any player with at least 250 catches over that span. And as an added bonus, Beckham has the best hair. Though I loved Antonio's Nino Brown tiered high-top homage and I appreciate Julio's conservative post-dreads look, Beckham's blonde Mohawk has become a cultural wave.